I look to the new year and my wish for youall..
An Autumn Filled with Love. A Winter Filled with Warmth..
Hope All your Dreams come true for you...Wishing all my blogging friends Happy and a wonderful New year! Happy New Year to You Jaishree! Happy New Year to u and ur family Jaishree ! Jaishree Happy New year to you and your family ! Hi, HAPPY NEW YEAR to you and loved ones. The pic is very pretty. Thank you for the wishes. 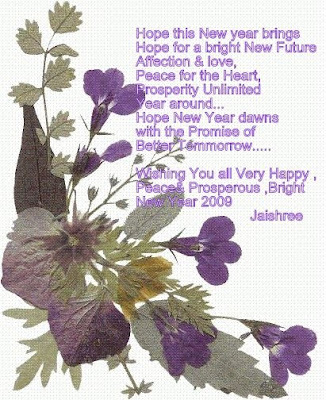 My hearty wishes to you too and to all at home for a very happy and Prosperous New Year 2009. May Peace, Joy and love be with you. Hi, am a new blogger..Entered into blogging after seeing all your people's delicious and dedicated recipies.I tried your peas masala..It was yummy.. Check out my blog when you find time..Wish you a very happy new year.. Thank you Akala sappade, Sriharivatsan,Srilekha :) wishing you all happy new year.